The last time I was in New York, Debbie Harry and I were both slim young things and all of the Ramones were still alive. So you can imagine there are lots of things I would rather be doing that sitting in front of the computer! Nevertheless, here is a snapshot of the end of my book signing session at Aedes de Venustas, where I had the pleasure of meeting many readers, fellow bloggers, perfume lovers who'd received the invitation and very cool clients of Aedes. So, the photo-souvenir of the main players of the event: my new friends, the adorable Robert (to the left) and Karl (to the right), the co-owners of Aedes, and the exquisite Laren Stover, who wrote my profile for the New York Times -- after her Bombshell Manual of Style, which I bought when it came out, her Bohemian Manifesto is currently my bedside book. A shout-out to Lucy Raubertas (Indie Perfumes), Avery Gilbert (What the Nose Knows), Francesca Bellanger, Douglas Bender (Charenton Macerations), and so many others... including an extraordinary fashion blogger, Valerie of Idiosyncratic Fashionistas! I did, and you were missed. So glad we could meet earlier, it was a great afternoon! I had such a wonderful time at the book signing! (I was the tall green-eyed 30-ish woman with the navy coat and long black ponytail.) 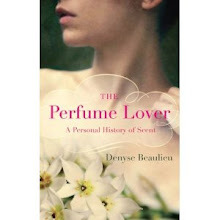 Just yesterday I finished reading The Perfume Lover, and it is inspiring me! Last night I went to bed in a cloud of Habanita, and today a long-neglected sample of Parfum de Therese helped me through a stressful day. I'm going to read some passages to my fiancé when he gets back from his trip. Elizabeth, of course I remember you! So happy the book is inspiring you to dig into your collection, and that you had a great time at Aedes (but then, how could you not? It's such a lovely place). 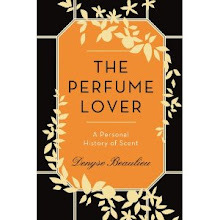 Sadly, I just found out about your book and blog - I got a copy of The Perfume Lover four days ago - just a bit too late to attend the book signing event. Cassie, what a pity! I'm happy at any rate that you found the book and the blog... Hope you drop in again! Denyse! What a wingding your A de V night must have been. I'm excited for you and am looking forward to your NYT profile! Well done, indeed. Hey Katie! I also did an event at Soho House in Toronto. Apparently they knew all about our own event last year in London - it went swimmingly, but I still wish I did *all* my talks with you! Sounds like you're a regular Soho House regular, Denyse! Not the worst place to be, is it? It was lovely to meet you, and I felt like we already knew each other, because there was such ease in conversation.